Updated 11-13-2018 - Updated the BucksPerkTest script to work with the latest game patch 1.47.49. 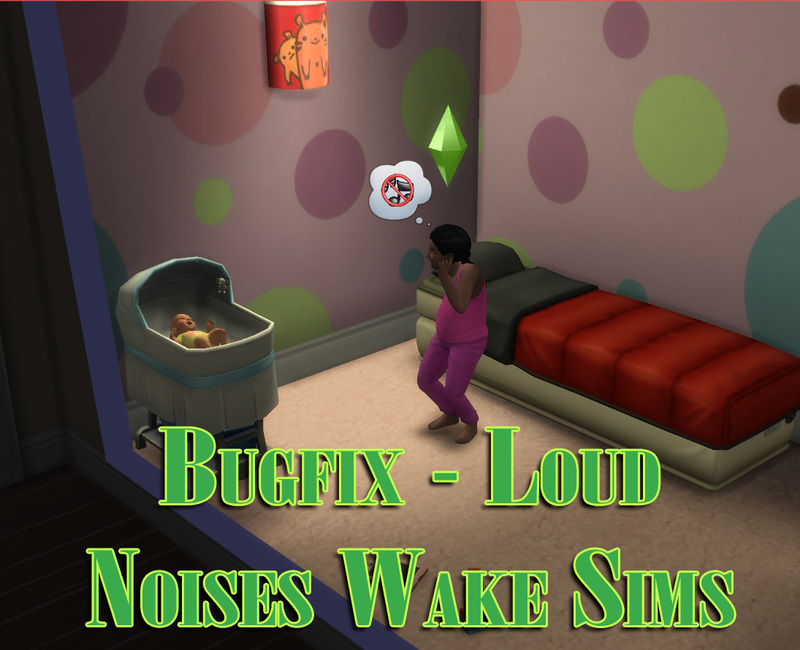 This contains two separate bugfixes for errors which prevent Sims being woken by, and reacting to, loud noises while asleep. In particular, this prevents Sims from having crying babies wake them up during their sleep. BucksPerkTest - This addresses an assumption made by the script that tests various aspiration and club perk tests. In the event that a required game pack for the test is not installed, the test alway returns a false result, which may not be the required case if the absence of a particular perk is supposed to be tested. This adds a test for this and returns true when appropriate. Specifically, if you don't have the Vampires pack, then your Sims are probably not vampires and so they can't possibly have the perk which prevents them from being woken up by loud noises. 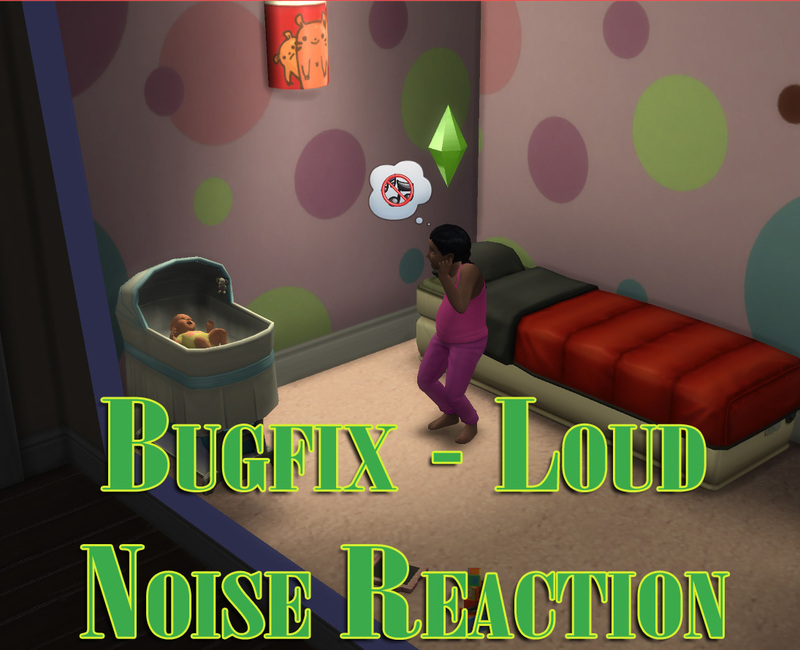 Loud Noise Reaction - A bug in the XML code for the loud noise reaction when being woken up resulted in the Sim being required to be both standing and not standing. Since this is a relatively impossible situation for even the most dexterous of Sims they will never react by holding their ears in annoyance. This removes the requirement that Sims should be not standing and forces them to stand to react - since they are standing from waking up anyway this seemed the best fix. Neither of these bugfixes are required if you haven't noticed or don't care about the issues they affect. I'll be reporting them to EAxis so that hopefully they will be fixed soon anyway. Although the BucksPerkTest was written to address the issue with Sims being awoken by crying babies, there may be other tests which fail due to the same bug. So just having the Vampires pack doesn't fix the issue, only a proper patch to the code will do so. There may be unintended side effects of this test working properly, particularly if an XML coder at EAxis did something in their XML as a workaround for some tests. I haven't noticed any strange issues yet, but I've only tested the game for a few hours with the fixed code. If your Sim's heads start exploding (or even something more mundane) please remove the BucksPerkTest fix and let me know. I'll look into whether the issue you've seen was caused by this change if possible (I only have a small handful of packs). The BucksPerkTest fix is a script mod, so simply unzip the file contained in the download into your mods folder (or a maximum of one subfolder deep). You must have script mods enabled for the fix to load. The LoudNoiseReaction fix is a standard XML package mod, so unzip the file contained in the download into your mods folder, or any subfolder. Script mods need not be enabled. These bugfixes were written for version 1.44.77.1020 (June 19, 2018) of the game, and may not be compatible with earlier versions. Please watch patch notes to see if either of these bugs get addressed in future game patches, at which point these fixes can and should be removed. Special thanks to Aberlour A'Bunadh Scotch for helping me cope with the hours spent trying to figure out why my stupid Sims wouldn't wake up when their babies started crying.